Since 1991 ENELEX has been successfully operating in the Czech market and since 1994 in foreign market with continual dynamic growth. Nowadays we have established a significant position among producers of special electronics and Automatic Fuel Samplers especially for mining industry and power industry. The ENELEX main selling areas are design and implementation of Coal Quality Management Systems for coal homogenization, manufacture of On-line Continuous Coal Quality Analyzers, manufacture of Automatic Fuel Samplers and manufacture of Oxygen Analyzers for combustion optimization and heating efficiency in power-plants, heating-plants and industrial incineration plants. We manufacture specially designed fire detection Thermal Imaging Systems, which we enhance by standard camera surveillance system. In relation to this we manufacture and develop durable camera housings, these systems and solutions are intended to work in harsh and demanding conditions. Since 1999 we utilize our Thermal Imaging Systems for contactless temperature measurement and monitoring of temperature trends in power industry, metallurgy, construction and security installations. Our analyzer measurement systems are suitable not only for coal but we have been able to successfully measure oil shale, not properly combusted coal and lately to measure plastic granules. We also provide services in area of Nuclear Safety. During research, development and manufacture we employ a team, whose skills and experiences are dated to very beginning of this area of expertise in Czechoslovakia, precisely to 1980’s. We manufacture and deliver our products to clients including installation, mounting and commissioning. In case of delivery abroad we collaborate with local companies to achieve seamless installation and commissioning to end-user. We design the system layout and cooperate with the customer on system maintenance, repairs and services. For these purposes we possess building complex containing electronic and mechanical production machinery and variety of measurement, installation and service equipment. Our aim is long-term and quality cooperation at the international level. We appreciate that our products are becoming more and more integral part of modern and advanced control systems and they help to reduce energy consumption and emissions. The Czech Republic – as a post-communist country – faced many challenges related to fast environmental improvement after its integration into the EU. In the 90s Enelex became a steady pillar in the restructuring program for mines and power industry. Today, after decades of development and experience, we are pleased to see our products being integral part of modern control systems enabling to save power and reduce emission in the atmosphere. The history of the company dates back to the founding of the group Elektronika in 1983. Elektronika group was initially specializing in the development and manufacture of special electronic devices for power industry which operated within the framework of Energostroj Chvaletice (a state owned company at that time). Skupina Elektronika zahájila v roce 1984 první provozní zkoušky vlastních analogových verzí gamapopeloměrů a analyzátorů kyslíku ve spalinách. In 1984 this group started the first functional tests of their own analogue coal analyzers and oxygen analyzers. Since 1985 the specialists have focused on incineration process in power plants, coal quality analysis and development of new types of oxygen and coal ash analyzers. Since 1990 Energostroj has manufactured and installed more than 500 oxygen analyzers and 100 coal ash analyzers in Czech Republic and exported these devices abroad within CMEA (Council for Mutual Economic Assistance). The group Elektronika also participated in development and manufacture of turnstiles and security gates for nuclear power station Dukovany and special medical devices. After October 1, 1991 Energostroj Chvaletice separated from ČEZ (Czech Power Plants) and a new company was established under the name ENELEX (ENergetics, ELectronics, EXport) by most members of the development team because new tendencies emphasized mechanical production and the Energostroj group was under threat of closure. In 1992 the new company Enelex finished development of the on-line radiometric coal ash analyzer GE 1100S (8080 microprocessor – based control system) and started its production. The production of computer controlled oxygen analyzers (AE 1200 with self-calibration intended for big power plant boilers and AE 500 T with a warmed probe for local automated heating plants) based on the same processor-based system in 1994 after development completion. Both devices quickly captured a big share of the Czech market. On-line radiometric coal ash analyzers became an essential part of the coal mining control systems in all Czech mines within 2 years. In 1997 analyzers were equipped with semi-automatic reference standard which increased speed and comfort in maintenance of analyzers in plants. In 1993 we diversified our product line and started to install special cameras for Surveillance Systems and Fire Safety Systems for Power and Coal Industries. Since 2005 we have been supplying special protective camera housings of HE series (if necessary) providing protection of the system in demanding industrial conditions, e.g. high dustiness or extreme temperatures. In 2000 we introduced a new type of on-line radiometric coal ash analyzer GE 2000 and new type of the oxygen analyzer AE 2200, at the same time we completely upgraded the oxygen analyzer AE 500. T. Using new technologies we achieved higher accuracy, speed and stability of measurements compared to the previous ones. Innovative properties and simplified control together with standard PC connection have contributed to success in the home-market and there started to be a great demand for these systems in foreign markets. 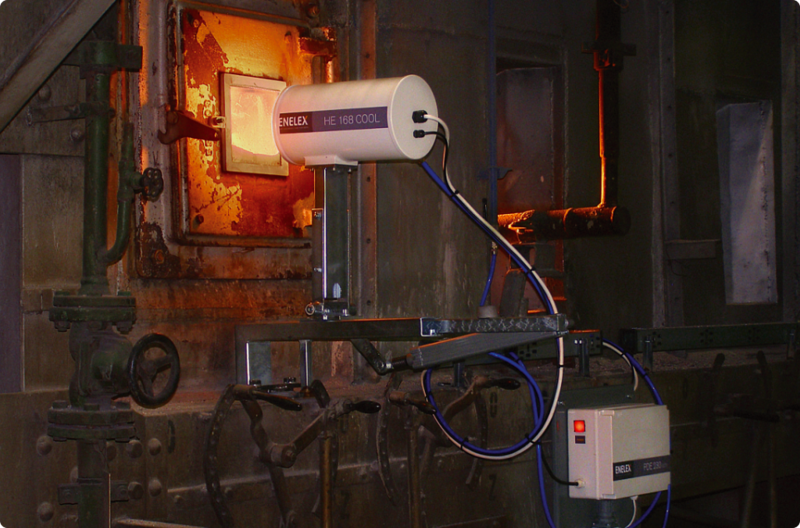 In 2000 we announced a launch of a worldwide unique system – Automatic Thermal Imaging warning system for safeguarding and protection of coal stockpiles against hazards such as spontaneous fire combustion. We have been developing the system since 1998 for use in coal-mixing stockpiles in strip mines. We have been continuously improving the system including application development for other branches of industry. This new system is in great demand but high purchase prices of cameras limit its worldwide spreading. In 2005 we delivered four big Thermal Imaging systems to South Korea for safeguarding and protection of coal stockpiles in coal power-plants. We also installed such systems for waste landfills, coal stockpiles and tyre stocks in the Czech Republic. Our experts finished developing third generation of On-line Radiometric Coal Quality Analyzers and Oxygen Analyzers. At the same time we have upgraded our Thermal Imaging systems using new, more affordable thermal cameras. More and more countries with widespread coal mining are interested in our products. We have now sales and service representations in Belgium, Bulgaria, Italy, South Korea, Macedonia, Romania, Russia and Ukraine. In the year 2010 ENELEX has entered the association “Česká Dobývací Technika” (Czech Extraction and Mining Technology) an alliance of Czech companies manufacturing machinery for power and mine industry with intention to strengthen company export politics. ENELEX managed to start two exclusive representation subsidiary companies in Europe and Asia – ENELEX Russland and ENELEX Kazakhstan and in the year 2011 we supplied first Automatic Coal Sampling equipment to Ukraine. Throughout the year 2014 we successfully established business partnerships and official representation of ENELEX in South Africa and India and started a subsidiary company ENELEX Ukraine. In the years 2014-2015 we proudly delivered first complete Coal Quality Management Systems to Russia, South Africa, Montenegro, India, Ukraine and Estonia. We also delivered multiple Automatic Coal Samplers to Russia to a great success. We spent a lot of time to modernize Thermal Imaging camera housing cover and the housing designed to withstand extreme temperatures, lastly upgraded was the entire Thermal Imaging warning system. In this period CQMS for the customer Severočeské Doly a.s. (North-Bohemian strip-mines) was successfully expanded by new equipment: 12 pcs of GE3000 and 5 pcs of ECA (Elemental Cross-Belt Analyzer) by Thermo Fisher Scientific enabling continuous sulfur analysis. Included in this project was also the new Thermal Imaging System HMGS 2. Essential to year 2017 was delivery of 12 pcs of GE3000 and GE3000.CM for CQMS in the Kolubara mines, Serbia, the delivery came with innovated analyzer’s covers capable of withstanding greater range of temperature fluctuation. We also managed to broaden our scope of offered technology and services by Mobile Water Drainage Systems used in strip mines. In 2017 new representative partnership was established in Indonesia and we opened up a new ENELEX branch with a focus to the Automatic Samplers in the second largest Czech city – Brno.